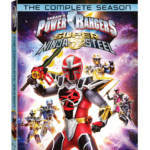 Lionsgate dropped us a line letting us know that Power Rangers Super Ninja Steel The Complete Season will be releasing on February 5th, 2019. The Complete Season will feature every episode of Super Ninja Steel including the Holiday specials. The set will be 3 DVD’s and retail for $19.98. Check out the full press release below. You can pre-order Power Rangers Super Ninja Steel The Complete Season on Amazon right now. 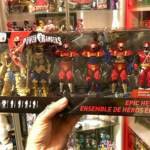 Each and every year, Toys’R’Us receives a 6-figure set of Power Rangers that they sell as an “epic pack”. That pack always contains an “exclusive figure or accessory” that you cannot buy separately. This year is no different! Courtesy @mightymorphinpowerranger on Instagram we now know what’s inside the pack! 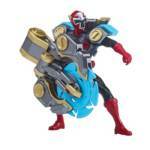 And for fans of Kelson Henderson, the actor who plays Mick on Power Rangers Ninja Steel and Power Rangers Super Ninja Steel, it’s your chance to own his first official Power Rangers toy! Here’s the part that will undoubtedly frustrate some fans. The item is still exclusive to Toys’R’Us. This figure pack was found in a store in Canada. For those following the situation with Toys’R’Us, the Canadian stores are NOT closing. With the US Toys’R’Us stores – they are closing at the end of the month and the distribution centers have closed meaning no new product will arrive. Get in touch with your Canadian friends! $49.99. Happy hunting! Voting is done through Twitter and the use of hashtags. Limit one vote per category, per Twitter account, per day. Start voting! Let’s celebrate the 25th Anniversary of the Power Rangers by getting two major wins for Power Rangers Ninja Steel! The Nuremberg Toy Fair is one of the largest Toy Fair gatherings in all of Europe and is often the first place to see brand new product. This year did not disappoint for those in attendance. 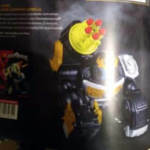 Thanks to Power Rangers Deutschland on Facebook, we have images from Bandai‘s product book that gives us our first look at the upcoming Power Rangers Super Ninja Steel Gorilla Sniper Zord and Ninja Comm! The Gorilla Sniper Zord was seen at the London Toy Fair. It is a Megazord-sized mecha that fires darts but does not have any combining features. The Ninja Comm is the communications device used by the Power Rangers Ninja Steel and is the first non-Legacy communicator to see a release. Check out both images after the jump! Will these be joining your collection? Let us know in our discussion thread for the Power Rangers Super Ninja Steel Gorilla Sniper Zord and Ninja Comm! Announced today by Power Morphicon the cast of Power Rangers Ninja Steel will be in attendance at Power Morphicon 2018 courtesy of Saban Brands! This is your opportunity to meet the current season’s cast with autographs and pictures. As customary, we expect a Power Rangers Super Ninja Steel panel at this year’s show (yet nothing has been announced as of yet) and the current cast to introduce the 2019 Power Rangers cast to the attending crowd. If you haven’t registered for Power Morphicon 2018 you can do so by clicking here. While you’re doing so, don’t forget to purchase your Power Morphicon 2018 exclusive Legacy 6.5″ Lord Drakkon figure as he will ONLY be available at Power Morphicon 2018! This Saturday on Nickelodeon airs the season finale of Power Rangers Ninja Steel. After Galvanax steals the magnet that Victor and Monty created, he uses it to steal the Ninja Power Stars from the Power Rangers one by one. The only Ninja Power Star remaining is the Red Ranger‘s … what will he do to keep it out of the hands of Galvanax? Find out this Saturday on Nickelodeon in Power Rangers Ninja Steel!